There are also thousands living undiagnosed with the condition, which could be harming their health. Type 2 diabetes occurs when the body does not produce enough insulin or the insulin produced does not work properly and can be linked to lifestyle factors such as being overweight. The symptoms of diabetes can vary - ranging from increased thirst, needing to urinate more - especially at night - feeling tired and having cuts or wounds which don’t heal quickly. The symptoms are not always obvious, and many people could be suffering with the condition for years before they learn they have it. 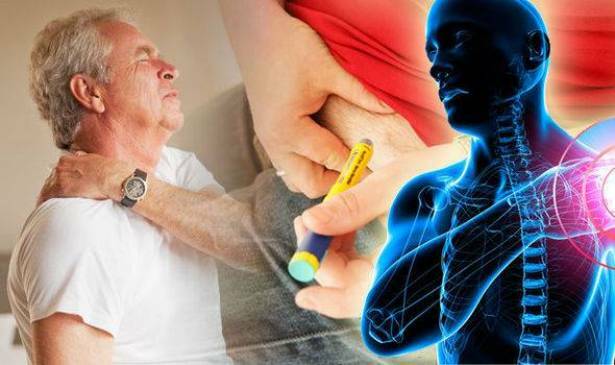 However, experts believe a condition called a frozen shoulder could also indicate type 2 diabetes in those who have no been diagnosed. They said the condition is more common among people with diabetes, than those without and the figures are quite startling. Experts writing in the Journal of Diabetes Investigation, published in the Wiley Online Library said: “The severity and risks of musculoskeletal complication might not be well recognised as cardiovascular complications, however the associated ailments certainly inflict both physical and psychological harm on people with diabetes. “Among the various musculoskeletal diseases, shoulder pain is one of the most common complaints. Frozen shoulder symptoms include pain and persistent stiffness in the joint. This can make it difficult to carry out normal shoulder movements and can impact day to day tasks. Symptoms of frozen shoulder tend to get worse gradually. However, experts are still unsure why the condition occurs - and why it is more common in diabetics. Experts believe chronic inflammation in the joint could occur as a result of hyperglycaemia, which could increase swelling in the joint. They also questioned whether taking a statin could reduce the risk of developing the condition. People with the condition are advised to take painkillers and non-steroidal anti-inflammatory drugs, or even see a physiotherapist.